Life, and everything attached to it, moves one step at a time, whether we realize it or not. Just like a child learning to walk, they always take that first step which is exciting and exhilarating for a watching parent and the baby herself. Yet, as we get older, the steps we take when trying something new can get clouded over with noisy, negative thoughts and worries; the excitement of new experiences gets drown out only because we are thinking too many steps ahead! No! 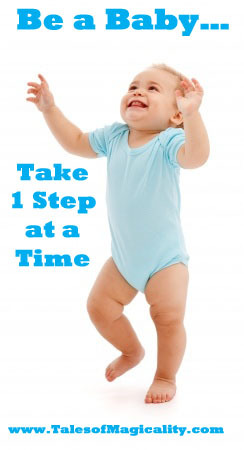 The baby takes that first step when she feels ready and then goes from there…one step at a time! Don’t let your mind “runaway train” with worries—pull the emergency break! Take 1 Step at a Time.